La Tentation is bringing its fusion cookery to Open Kitchen in Hoxton for one night only on Saturday 23rd February. "Dive Into La Tentation: Imagine the fusion between traditional French and British cuisine, with the exotic flavours, colours and perfumes of Asia. Imagine a unique, adventurous dining experience, a culinary voyage of discovery in an eco-fresh environment. 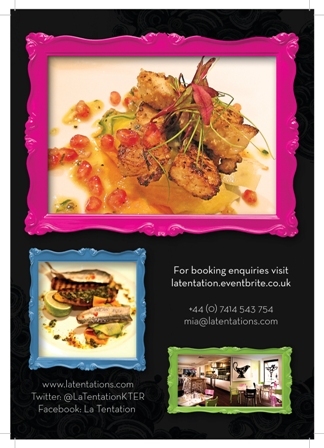 For one night only, La Tentation brings its exclusive and elegant dining to Hoxton. Délice de chocolate and coconut, honey liquor infused exotic fruits"